FieldCandy Space Tent on Super Sale! So Carl Jung was all about watching for synchronicity. Ya know, meaningful coincidences. Just this morning I saw Thee Cutest tent in all of existence while skimming through tumblr. “A tent that looks like outer space? Stop everything, I know what my summer needs!” My brain was already busy creating scenarios to prove that I did in fact need this piece of stunning camping gear. 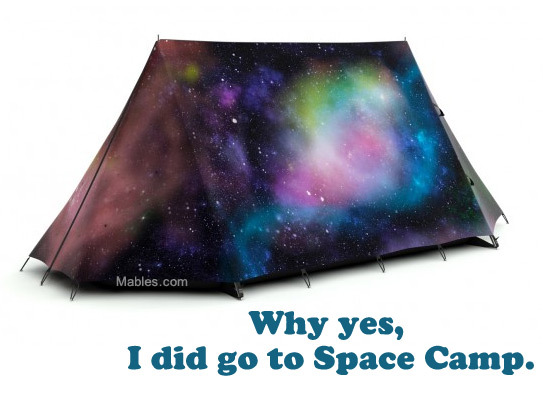 A few hours later I got an email letting featuring The Tent of Spacey Beauty… ON SALE! Commence happy dance! Think Geek has deliciously discounted this spacious tent as part of their super summer sale. In their words that “means it’s time to SLASH PRICES IN THE FACE!” Oh, that does have a ring to it. What do you think of FieldCandy’s take on the classic tent? Do they inspire you to get outside and make some spacey fun?